Pension Finance: Putting the Risks and Costs of Your Defined Benefit Plan Back Under Your Control, by Barton Waring, is now available from all the usual book vendors. It’s a CFA Institute book, published by Wiley. 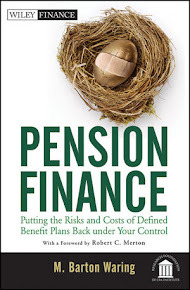 This important book offers a window into the inner workings of the DB pension plan, and by looking through that window the reader learns how to bring the plan under control. As anyone reading this knows, it has been difficult or impossible for the non-actuary to have any idea of what is going on inside the plan, and they have had to surrender nearly complete control to the actuaries as a result. And the results have been disappointing to say the least. Sponsors have experienced a continuous flow of negative surprises in pension contribution requirements and in pension expense accruals. They’ve experienced a completely illogical and unexplained swing from perfect health in the 1980s and 1990s to a continuous disaster of bad health throughout the first decade of the new century. Funded ratios are well below parity in both corporate and governmental plans, representing real current debt owed by the sponsor. Managing the pension plan should not be all that hard. After all, the pension plan is just a big bond, an aggregate pile of deferred life annuities and present life annuities. There are complexities, of course, but no more so than for many other bonds and securities actually found in the markets. To finance such an obligation should not be a mystery, and by using modern finance tools instead of traditional actuarial finance tools, the mystery is immediately removed. 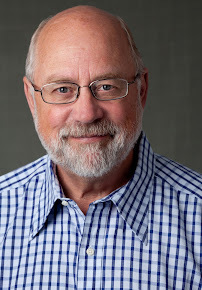 · The book shows how amortizations and smoothings increase risk, rather than reducing it. · The book shows the economic nature of the several liabilities that are important—the full economic liability, the present value of future benefit payments, the accrued liability, etc, and the important ways in which they relate to each other. · The book shows that normal cost is just an amortizing payment—like a mortgage amortization payment—of the difference between a larger liability measure, the present value of all future benefit payments, and the accrued liability. Similarly, the makeup contribution is just the difference between the accrued liability and the actual assets on hand. This latter difference should be paid immediately, but one can demonstrate amortizations for it as well. These are financing concepts no more complex than paying off a mortgage, or saving for the kids’ college. People think that the actuarial numbers are not comprehensible by non-actuaries, but in fact they are completely comprehensible when reduced to such economic basics. · Importantly, with simple simulations the book shows that the continued used of the traditional expected return assumption nearly guarantees eventual failure of the pension plan—if not in this generation then likely in the next. And after 11+ years of roughly zero returns where the actuaries were expecting not the 4% or so of the risk-free rate, but instead 8% or so for public plans and 6% or so for corporate plans, the assets are far less than what they “should” have been (half, for public plans, and about ¾ for corporate plans). No wonder pensions are in a quandary and near failure today, as there has been far too much faith and reliance put into the false notion that a long term investor will get the expected return over time. The only correct discount rate for payments that have to be made without risk is not the expected return on assets or the risky high quality corporate credit rate, of course, but rather the risk-free rate. · And best of all, the book shows how with market value numbers one can see a path that nearly completely removes risk from the plan simply by hedging appropriately (think LDI, but not the ad hoc version seen today, a more complete version based on solid finance theory). And by removing risk, the book means removing volatility of surplus, volatility of pension expense, and volatility of contributions. This would make pensions much more user friendly to plan sponsors, who are tired of the seemingly endless stream of negative surprises brought to them by their pension plan using the traditional actuarial finance methods. · The book shows the misleading duration of the accrued liability as it is conventionally computed today. It actually has no duration of its own, but instead its duration is derived from the difference between the duration of the present value of benefits and the present value of future contributions. Traditional duration measures presume that the accrued liability is freestanding. If hedged using that traditional duration, the hedge won’t remove risk from contributions or pension expense. The biggest point is one of salvation, however. The path to solvency and health for pension plans is through market value management. There is no other way to rationalize the employees’ demand for benefits with the ability of the employer to pay for benefits. The DB plan is one of the best vehicles ever designed for taking a portion of one’s working life income and setting it aside for one’s retired life income. We want them to survive. The book shows the path. There is pain involved, of course, as the traditional actuarial models doled out generous benefits and told the employer and the employees that they cost only about half of what they really cost. But there is also a path to success. The book has a section devoted to the tough love process of getting from where we are today, back to a healthy pension system. This book will prove compelling to anyone that has struggled to peer through the actuarial mist and figure out what is really happening, “under the hood” of the DB plan, and who wonders why these plans have to feel so risky to the sponsor. The answer is, they don’t have to feel so risky. I think it is fair to say that this book presents a dramatic new set of insights into pension plan risk and cost management, and is the leading work—perhaps the only economically sound work—on the topic in its fullness. While its first use is as a tool for pension management accounting, it is of course as blueprint for where our GAAP accounting requirements need also to go, at all levels including the IASB, FASB, and GASB. The book is exceedingly well reviewed, with a foreword by Robert C. Merton of MIT and positive reviews by (among many others) Brad Belt (former PBGC head), Guus Bonder (lead pension guru in Holland), Frank Fabozzi (editor, Journal of Portfolio Management), Richard Grinold (former CIO of Barclays Global Investors), Roger Ibbotson (Yale; Ibbotson Associates), Marty Leibowitz (Morgan Stanley), Lionel Martellini (Princeton), Olivia Mitchell (Wharton), Dallas Salisbury (Employee Benefits Research Institute), and Noboru Terada (leading pension thinker in Japan). While the book is widely available, one oft-used source is Amazon.com: http://www.amazon.com/s/ref=nb_sb_ss_i_2_15?url=search-alias%3Daps&field-keywords=pension+finance+waring&sprefix=pension+finance.